After clearing the crab trap from the anchor headed for Port Angeles 58 miles to the east. We delayed our departure until about 9AM to minimize the ebb tide effect. I was surprised how big the ocean swells were almost all the way to Port Angeles. They were not steep but 4-5 foot and occasionally broke as the current impacted them at points along the way. A pod of Orca's was outbound and we saw a couple of other whales. The smell of pine trees along with the ocean breeze is really invigorating. This PNW thing may be all its cracked up to be. 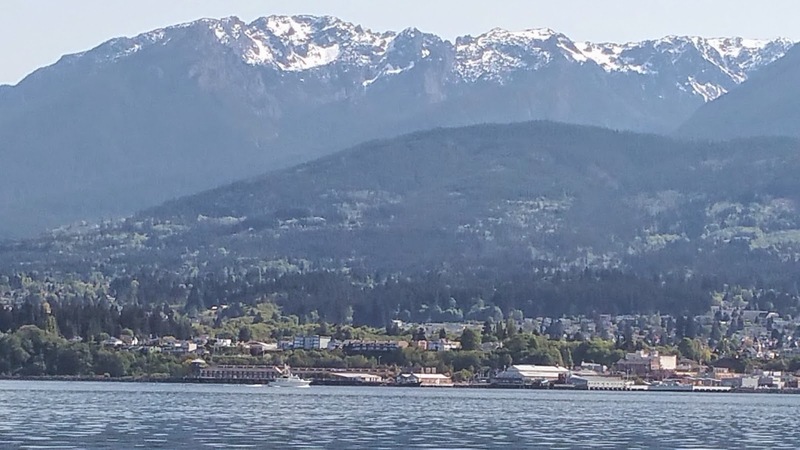 Randy, our friend who has been a day ahead of us most of the way up the coast (Antipodes) took this shot from the spit as we entered Port Angeles. Its a busy commercial harbor with a comfortable marina for pleasure boats. Surprising, this offshore oil platform was being completed in the outer harbor. Its massive. The tug boats are about 90 feet long. Security was tight as we passed by the platform, a guard boat shadowed us until we turned into the marina. Later we found out the environmental protection community has been protesting the presence of the platform and Seattle is making them reapply for a permit to bring it into the harbor there. Shell plans to take the rig to Alaska when completed. The local news reports say Seattle should not be a part of oil drilling and its support. Looks like a lot of jobs could be taken somewhere else even with no environmental drilling risk to the local waters. Well let's hope its legal......Wonder where the illegal stuff is sold? Rented a car and went to the Olympic National Park. Nice drive to Hurricane Ridge complete with a little snow. Temps went from high 50's to 30 in about 15 minutes. The overlook was covered in clouds from about 4,000 ft up the crest. Just one of the great vistas from the mountain. Visited Port Townsend and on the way stopped at Sequim for lunch. At the end of a long winding road we found a launch ramp and a few picnic tables to enjoy our Chinese take out. This memorial was well kept and intact. Placed in 1944 it's titled "Freedom Is Not Free". Box Score 8 Hours, 31 gallons, 60 miles 3.875 gallons/hr. Next we move to Garrison Bay near Roche Harbor on San Juan Island.